This is me presenting Howard with his birthday cake at his birthday party. It got me thinking about other birthday cakes I have made that I love. There is something special about making a birthday cake. I am not an expert at it! I am no good at cake decorating and never will be. Fussy things and I never agree. For instance I have never worked well outlining my projects which is one reason my Leonard Pennario book still has a little ways to go. Not much but a little. What I am good at though, is that when I make a birthday cake I really love it. 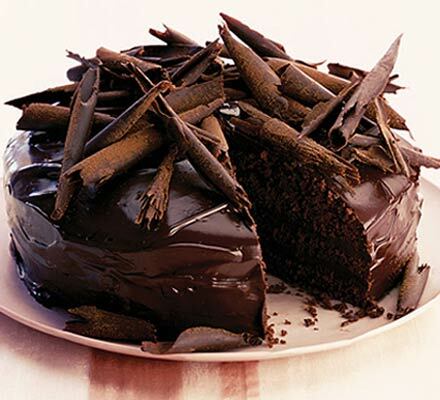 The cake in the picture above, it is a sheet cake off of AllRecipes.com. Whenever you want to make something fattening AllRecipes is your friend! A few other birthday cakes stand out in my mind. Once back when I was holding Monday night jam sessions at my house, my friend Peggy Farrell the jazz singer was celebrating her birthday. I made the Oatmeal Cake out of one of the Moosewood Cookbooks, I think "The Enchanted Broccoli Forest." It baked in an 8 1/2 by 11 pan, definitely nothing fancy. But that was the whole charm. I still love remembering this cake. You made it with yogurt and oatmeal and it was dense and country-ish. I frosted it with a caramel frosting I got out of "The Joy of Cooking." 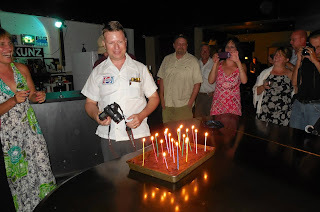 Then I just stuck a bunch of candles in it and I loved carrying it out. It went, too. Everyone ate it. Here it is! Oatmeal Yogurt Cake from "The Enchanted Broccoli Forest." I found it! If you have never made this cake before, try it. Make it for someone's birthday. Trust me. 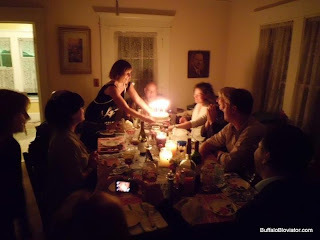 More recently, a couple of years ago, my friend Michelle from work was celebrating a birthday and we did a little dinner at my house for a bunch of people from the office. I asked Michelle what kind of cake she wanted. That is a wonderful question to ask. I love asking it. She asked for Red Velvet Cake! Which I had never made. But that never stops me. I researched recipes and made Red Velvet Cake. It was in style during the 1920s. I learned that while I was reading up on it. You had to use red food coloring which disappointed me a little. I had thought it had beets in it or something. Plus, I am warning you if you try this at home, a little red food coloring goes a long way. I saw recipes that called for a whole bottle! Luckily I chose one that needed just a teaspoon or something. Even with that, the kitchen looked like a car wreck. There was red everywhere. But the cake turned out glorious. I mean, I loved it. It was a layer cake which I am not used to making so that gave me a thrill, trying to make one. I have a picture somewhere of me serving it to Michelle. Oh, look, I wrote about it! Just now I started getting the sneaking suspicion that I had. Here is the picture. Oops! That is not the picture! I do not think I ever made that cake. I am not talented enough. I do not know how it ended up in my files. Here is the picture. So, enough about the red velvet cake, seeing that we have explored that before. There is one more cake. That is the cake I made for Howard last night. It was his actual birthday so, another cake opportunity, not to be wasted. I had already made the cake pictured at the top of the post, which was a chocolate cake as he had requested. So now I made Blueberry Pudding Cake out of the Mark Bittman cookbook, "How To Cook Everything," that I scored for a buck at a garage sale I went to with my friend Lynn earlier this summer. Howard loves blueberries, ergo this cake. It baked in a water bath -- weird, because I had made Mollie Katzen's Peach Pudding Cake and I do not remember it needing that. You also had to separate a bunch of eggs and beat up the egg whites, another thing I do not remember from that peach pudding cake. The Blueberry Pudding Cake turned out great. There really was pudding in it! I had no birthday candles on hand so I used tea lights. Howard took pictures. I am going to have to wring them out of him and post them. The moral of the story is, you do not have to be a professional cake decorator to turn out a birthday cake. It is the thought that counts! Hmmmm... I was just going to end with that, but all of a sudden I realized: Isn't it funny, I just noticed that the post I linked to was exactly a year ago today. That is a coincidence. I was writing about a garage sale where I bought a cake carrier. And my mother was there with me, giving advice on the cake carrier I was buying. That was just a year ago! It makes me happy that my mom was out with me at garage sales that recently. Celebrate the time you have with people. Celebrate with cakes. They do not have to be perfect!